HONG KONG, CHINA--(Marketwired - May 10, 2016) - Artesyn Embedded Technologies is extending its MaxCore™ technology to Intel's 'Rack Scale Architecture' to enable operators, carriers and enterprises to add acceleration to their evolving software-defined infrastructure. Rack-scale solutions offer total cost of ownership benefits that have been recognized by hyperscale computing firms such as Facebook, Google and Amazon, communications and cloud service providers and an increasing number of large enterprises. 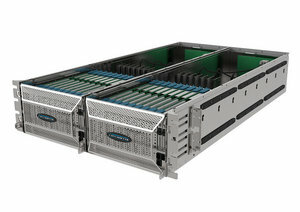 The MaxCore™ Hyperscale Platform will bring the significant CapEx and OpEx savings of Artesyn's MaxCore architecture, enabled by massive density and flexibility, to cloud deployments of virtualized network functions, such as the Cloud Radio Access Network or C-RAN and Mobile Edge Computing (MEC) applications. C-RAN is a centralized, cloud computing-based architecture for radio access networks that supports 2G, 3G and 4G networks and is intended to support future wireless communication standards such as 5G. In a recent article, Frank Rayal, Partner at Xona Partners and Joe Madden, Principal Analyst at Mobile Experts LLC, wrote: "The trends in wireless network evolution indicate that we are currently at the cusp of bifurcation in network architecture and technologies, and even commercial practices. Operational processes remain rigidly entrenched. Operators will have to look for new means to meet the demands placed upon them by customers and investors more efficiently and effectively. Cloud RAN has the elements to provide flexibility necessary in future wireless networks, and in the indoor market, emerging solutions may break new ground toward low-cost, high density mobile infrastructure." Stephen Rousset, distinguished engineer and director of architecture, Dell Extreme Scale Infrastructure, said: "Collaborating with Artesyn to bring application-specific technologies to our Extreme Scale Infrastructure (ESI) group demonstrates how Dell combines the insights from the hyperscale players with the unique needs of carriers and service providers. The Dell DSS 9000 is an open, flexible and efficient rack-level infrastructure, and when combined with the MaxCore Hyperscale platform, we can deliver C-RAN functionality in mobile edge networks and continue to gain traction in the growing sub-hyperscale market." Todd Wynia, vice president of platforms marketing, Artesyn Embedded Technologies, said: "Artesyn is becoming an active participant in the ETSI Mobile Edge Computing Industry Specification Group and we're seeing that the network edge is experiencing a major revolution. As operators and carriers examine and trial virtualization and acceleration technology, they can see the benefits not only to their next-generation 5G deployments but also in making their existing infrastructure more efficient and cost-effective. Artesyn's new implementation of the innovative MaxCore architecture for Dell DSS 9000, with unparalleled density and configuration flexibility, makes a compelling, cost-effective case for accelerating wireless applications."